Hollybeary Creations : VersaMarker Tutorial.. 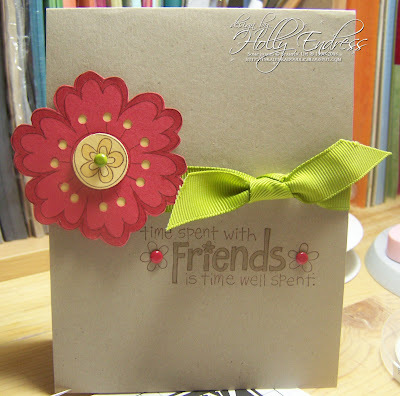 This is a card that was featured on the Sampin' Up! website a few months ago. It is the perfect card to demonstrate one of the way to use a VersaMarker. A VersaMarker is a watermark Pen, just like the pad only in marker form which makes it much more versatile. This card shows you how to use it to color an image with, allowing you to use the original color of the Card stock to give you a tone on tone instead of having to use another color of ink. I hope that makes sense. I loved the speed of your tutorial. Good subtitles too!